Yves here. I have more quibbles with Tverberg’s latest post on the future of fossil fuels than I generally do with her work. First, she discussion the correlation between energy use and economic activity, and then is fuzzy regarding causality in not a good way. Second, she provides some very good data on the current levels of renewable energy production, and then argues for a linear projection of present growth rates. You could make much more aggressive assumptions and her conclusion would still hold. Population increases mean more energy needed. Population decreases don’t mean energy production decreases. 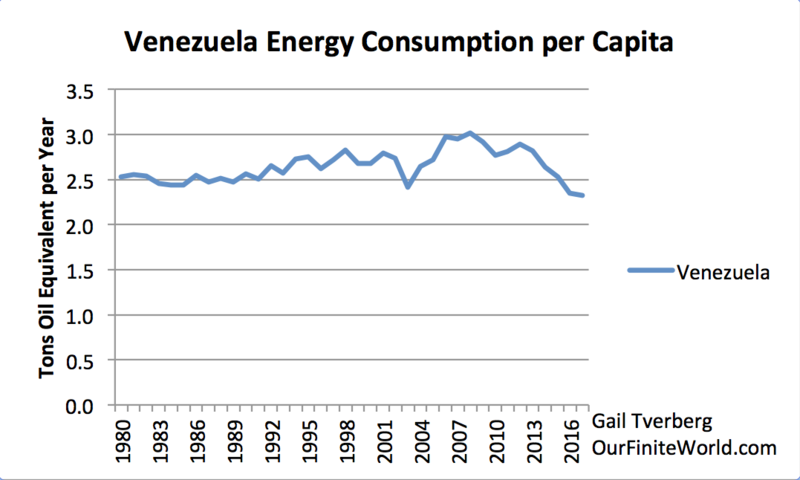 Therefore reducing population means less need for energy production increases and more energy per capita. Not good enough at math to figure this, but wouldn’t a certain level of population freeze or decrease extend the time before oil runs out and allow more time for renewables? into our high energy consuming society? Because competition of course! Also it used to be “who has the gold rules”, now it’s “who controls the price of oil rules”. Then we enter the geopolitical arena, where the PTB decide on the one hand to press venezuela with low prices and arbitrage that against cheap cost to consumers/servers/servants in the “developed” world (quants could probably come up with more convincing examples). I am so cynical about where we are now. Among other salient points in the post, I agree with the premise that we’ll lose fossil fuels in a very likely abrupt fashion and those in charge are hitting the accelerator. Importing third-worlders? Wow. Just, wow. Is that how you think it works? You know this is 2019, not 1819, right? Any idea why those people from those other countries might be attempting to migrate here, despite all the risks? Could it be that they are facing unlivable situations in their home countries? Could it be the US policies and US corporations have had a lot to do with the living situations in their countries? How about this: all of the supposed environmentalists who want to drive to the store, fly to their vacation, buy and use every electronic gadget they can get their hands on, actually take the problem of their own energy consumption seriously, rather than blaming others? It’s not one or the other, it’s both. Regardless of culpability, we are effectively “importing high fertility third worlders.” But point taken about US corporate and MICC policies. If one were so inclined, one could easily conclude conspiratorial overtones are at work there. If one were so inclined, one could easily conclude conspiratorial overtones are at work there. There are interlocking interest that benefits from the importation of cheap, controllable, and disposable workers. Everything from union busting to cheap household help. The law is routinely broken and the enforcement is a joke unless you count the wretched escapees from the American created economic and political Hellscapes locked up the at the Southern border. The H-B1 holders are doing fine as the last major decently paid group in the 90% are tech workers. With thanks for addressing this topic of utmost importance, this strikes me as just so much economese. The final line, “The fact that interest rates cannot drop much further is particularly concerning” – is particularly deflating. So, please accommodate the fossil fuel industry because otherwise the world will be hit by a financial and economic crisis? That’s some policy proposal to excite the masses for the future. “The electrical system is very complex. It seems to be easily disrupted if there is a material decrease in energy consumption per capita because maintenance of the system becomes difficult.” Uh.. what does that even mean? Is this an actionable piece of information meant for an influencer or a decision and policy maker? What kind of serious person could use this equivalent of hand waving? And using the Soviet Union, Syria, Yemen, and Venezuela to extrapolate global scale patterns for today and the near future….? ?Why not India, China, Africa, ASEAN? I modestly suggest that more than quibbles are in order with this work. Hahaha! I like you nickname. And the point that you discuss is important. Utilities seem (and I say seem with an objective) worried about that. About system maintenance while consumptiom reduction follows suit. My opinion is that they are somehow rigth but also that they tend to overrepresent this fear on the basis of their bigger fear: a reduction in their consumption mass and revenues. I would like if an expert on electric grids expands on this. As I understand it big inflexible utilities like carbon or nuclear would collapse when their consumption base is reduced from certain level and that would result in energy shortages. So, with short stepwise reductions we migth have at some point high disruptions. To be sure, regarding your second paragraph it works exactly like that. Utility friendly influencers go and convince policy makers that energy efficiency and renewables are so bad because of maintenance and disruption. I have watched this in few energy forums attended by policy makers. These were very sensitive to this claims. I believe that the problem is not that important if a central planner is given the power to select when and how big utility centres are decomissioned in an orderly fashion. Pacific Gas and Electric in CA is a poster child for the effects of under investing in Maintenance. Gotta support that share price and deregulation! Please take a minute to find DOE’s Wind study. And look at Hydro.org. And of course look at the LED revolution. Or the refrigeration compressor revolution. Energy is important however there are a multitude of choices to be made which take advantage of available non fossil fuel resources. Sorry but this comment is a handwave. You don’t make an argument and you don’t present data. This is logically like saying, “A deficit hurts the economy, look at Bloomberg”. If you have an argument to make, make it. But if you make another comment this lame, you will be put in moderation. So, yeah. Bring on those LEDs, cause that will SOOOOO save us. And to all NC’ers: please check out Low-Tech Magazine, as they have very solid and interesting articles on this type of subject. Having worked in IT since the 1980s, heck yeah. All our ‘energy-saving’ gizmos let us use MORE energy than ever before. Also kudos to Low-Tech Magazine, though at our current rate of decline, you may want to print out articles you deem useful onto acid-free paper! For example, the advance of solid state lighting (LED), which is six times more energy efficient than old-fashioned incandescent lighting, has not led to a decrease in energy demand for lighting. Instead, it resulted in six times more light. I have to think there’s a correlation, not causation, factor going on there. When I moved into my current house I took about replacing the old incandescent lights with LEDs as the old ones died, and it made an appreciable effect on my electric bill. However, my response to that was not “Hey, let me slap in a few more fixtures per room, the house will be lit up like a christmas tree but I’ll be paying as much as I did before.” I would think the mass increasing in lighting would be caused by growth; more buildings, more light fixtures, more lighting. It seems to me that much of this analysis is confusing cause and effect. Those countries economies shrunk because they were in recession and industry and individuals were using less energy, not the other way around. The rise in oil prices also did not significantly hit Spain and Greeces tourism industries – airlines and other businesses more or less absorbed the costs (aided by hedging). Air prices did not appreciably rise. Tourism dropped because the tourist generating countries were in recession and people cut back on holidays. It obviously requires ‘deep’ investment, but countries like Sweden and Switzerland maintain high standards of living while generating perhaps one third of the CO2 per capita of north America. That indicates that with coherent planning, there is significant scope for reducing energy use without impacting on standard of living. Another issue ignored is the normal plant replacement cycle. Cars are replaced on perhaps an 11 year cycle, bus and train rolling stock on perhaps 2-25 years, large fixed plant such as power stations on around 25 years. If the two power sources are of equivalent capital cost, then there is no ‘cost’ involved in switching from power source A to power source B if it carried out within the normal capital replacement cycle. The UK, for example, switched pretty much from coal dependency to gas electric power generation capacity in little more than a decade back in the 1980’s-90’s, driven entirely by cost dynamics. Much the same process occurred in the US in the past few years, also driven by cost dynamics, although the transition was probably slowed by efforts to prop up the coal industry. How much difference does energy usage differ in the US because it is much larger than countries like Sweden? Sweden is the 3rd largest country in Europe with a population of 10 million people with 2.3 million living of them in the capital metro area. The US has about 40 of those sized areas. Does this impose a structural cost in energy usage? Is it significant? Its the opposite – with electricity generation smaller grids tend to have more energy costs (its tougher to match supply and demand). This is a huge problem with island grids – its why, for example, Ireland spends billions on energy storage and long distance interconnections with other grids. There is however a strong linkage with density – densely populated countries for fairly obvious reasons tend to be more energy efficient. Hm, I think any comparisons will be very dependent on location, at least in the US. The climate varies far more over the geographical area than in Sweden – this will affect heating and cooling energy requirements. The next thing is population density – Sweden has basically two quite dense cities, and the bulk of the population in the south, while the rest of the country has very low density – this will affect energy requirements to transport energy. Finally, the energy mix, at least when it comes to electricity generation is also quite location dependent in the US, compared to Sweden. Sweden is around 50% nuclear, 40% hydro, and 10% other, with a well integrated national power network. The US is heavily reliant on fossil fuels in many regions and has a less integrated net. The US is in the difficult position of having a geographically dispersed fossil fuel energy consumers, so that distributing energy requires energy in itself. Sweden is in the easier position of having comparatively concentrated consumers using energy that is lower carbon to produce and distribute. This basic analysis however excludes external carbon emissions (manufacturing in Asia, aviation), where Sweden probably comes off worse, on a per capita basis. Yes the point that these countries suffering energy use declines did not plan these declines and go about them in an orderly fashion is worth making. Instead the energy use declines appear to more of a symptom than a cause, and that gives me a little hope that with a good plan in place the transition to a lower energy economy can be less devastating. That is assuming that oil production declines do not pull the rug out from under us while we argue it over which looks likely. the french and UK charts do not make her point either. both of these economies have been growing since 2004. the civil unrest in each is a result of increasing inequality caused by austerity and socialism for the rich. 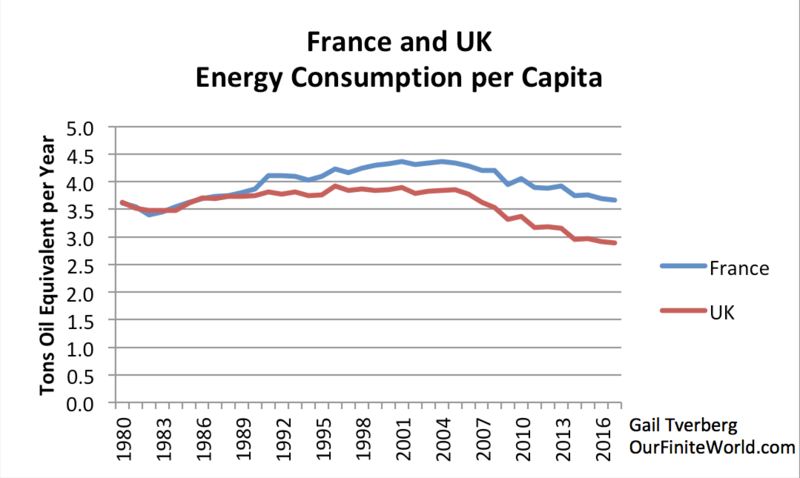 so indeed, energy use in the UK and France is falling mostly due to greater efficiency, and not economic shrinkage. exactly my thought that causality is the other way round in the examples! I wolud be very, very, very reluctant to draw so many conclusions from the BP study. It isn’t that it is bad or flawed, no. It is just that what the energy outlook represents a picture -a complex one- on how development has been achieved in the wings of the fossil fuel dragon and how difficult is for us to even imagine an alternative. The limits are not set by physics but psychics. We need something like a big virtual slap in the face to realise all of our current wrongdoings. My example is Spain. Oil consumptiom peak reached 75 million tons in 2007 when we (the spanish as a group) thougth that we should be building apartments and houses for all european -and a few american- retirees, sun-seeking families, and african & southamerican migrants. To the tune of licenses in 2007 to build 900.000 units in 2007 of which many did not even see the first brick. Previously, it was considered normal or vegetative growth to build about 200.000 units annually. To say that we were spending as much as we could afford is an epic oversimplification. We were just wasting enormous fluxes of cash coming from “austere”, “well meaning”, “wise” — I am out of calificatives– investors living in consumption capped economies. And we are now supposedly trying to pay back those wise guys that thougth it was reasonable such building spree. And here is the point. To illustrate the extreme crazyness reached those years, one municipality in the mediterranean coast passed permits to build what was called ” Manhattan in Cullera”, a row of about 37 building towers for 20.000 inhabitants… but without enough drinking water. Sadly enough plans are being made now to revive this project. This means, if anything that 12 years later we are still in crazy mode. That is why I say that the limits are not physical but psychical. Bear in mind that accompanying the building crazyness there were plans to build the necessary energy infrastructure in the form of huge natural gas burning plants. Those plants were buildt and in 2018 they were functioning at 18% of their capacity. There were also plans to divert lots of water from spanish most migthy river, Ebro, to feed the thirsty mediterranean agriculture/touristic complex. It was crazyness with method. Those plans were fortunately cancelled. To say that “we were consuming the energy we could afford” is to say something utterly incrrect. We were just following a path of crazy unsustainable development fuelled by fossil fuels. We have to change our mind on this. In fact we passed from 75MM tons of annual oil consumptiom to a low of 55MM and then resumed growth to 56MM which is still high by european per capita standards but no as crazy as it was. That is a 25% reduction that was not accompanied by an economy shrinking that much. Nothing physical, just psychical or psychological. During the late crisis years, Spain has enjoyed an utility-friendly fossil fuel friendly conservative inept government that has been late –and wrongly– passing all the EU directives aimed at renewables and energy efficiency to the extent of annoying their correligionary EU authorities. 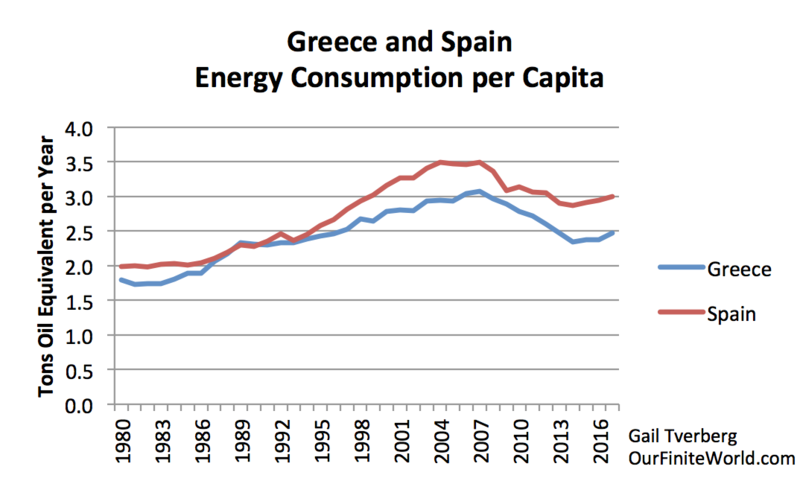 That explains why Spain didn’t follow the path of France or UK with more sustained energy consumption reduction. It is not that we can afford it now, It is that the government stimulated it. Well that is enough for a rant today. The only thought this leaves me having after a literal reading is we need to aggressively raise interest rates as soon as possible. Short term financial pain in return for a possibly sustainable environmental future long term. Dovetails nicely with Michael Hudson’s calls for debt jubilee. I have my suspicions this is not what the author wants us to conclude, however. The author cherry-picked stunningly bad examples… Greece, Syria? As if the per-capita energy consumption caused their (obviously external) problems rather than resulting from them. It really makes the whole exercise very suspicious. The consistently bad choices, and willful ignorance or downplaying of external factors seems larger than random error would allow. The commenters seem to have already identified many issues with this post. It is overly long but does not demonstrate any concrete understanding of what an energy transition implies or can do. The main argument misses the fact that technology transition dynamics are exponential in their early stages – it is equivalent to someone arguing in 1900 that since there are only 1000 motorized cars and millions of horse-drawn wagons by 1920 at most we can expect a 10% substitution. This is not how historical transitions work. Once the substitute technology achieves scale then the rate of the transition becomes exponential. Renewables are currently the cheapest form of electricity generation in the world! This fact has not yet registered widely but I challenge any nuclear or fossil proponent to provide unsubsidized power purchase agreement (PPA) prices of say 1.79c/kWh of PV (the Masdar KSA bid) or 2c/kWh for wind (average US wind project). These prices are literally cheaper than anything and they are not exceptions. The fact is that it is technically possible to run a world with 100% renewables and it is likely cheaper to do so. Nevertheless, it does require a consistent policy mobilization. The transition period will indeed see a hump of fossil fuel use that will be used to build out the RE plus storage infrastructure in what we called the Sower’s way. With regard to the correlation between economic output (measured by GDP) and energy use, this is well established. Clearly, a 100% RE world will need to stabilize at a given rate of energy output. This can be higher than current energy use but not by much – this is why all our Sower scenarios stabilize by 2100. 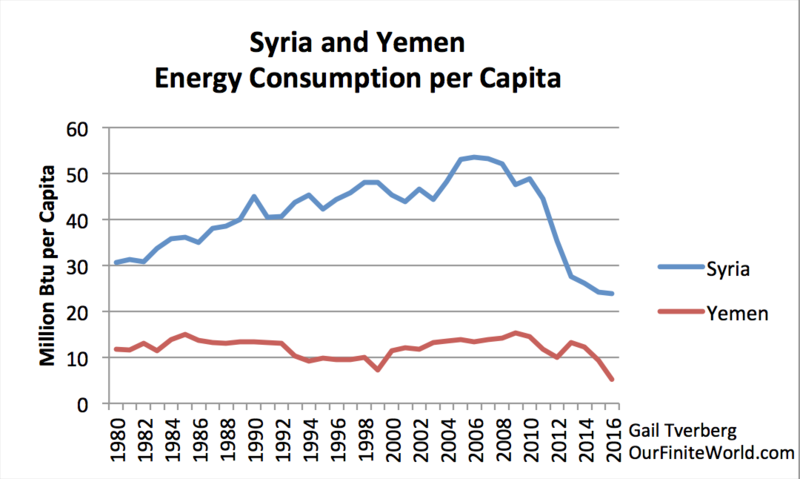 The problem that countries like Greece and Spain (I leave out Yemen and Syria as we are not talking about war) faced is that the population and the country’s infrastructure was not prepared for the sudden drop of purchasing power due to the crisis. 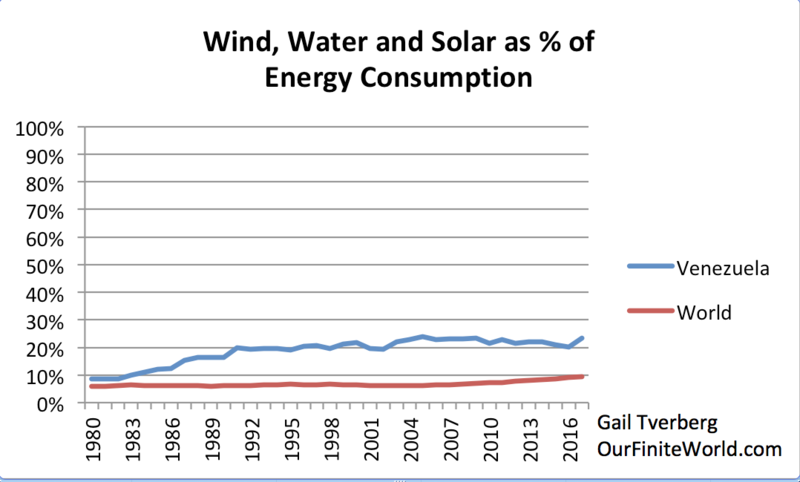 Had they started the transition earlier investing in the low-interest years on alternative energy and energy efficiency the drop in energy use would be the same but the well-being would have been steady (or even increased). You have a lot of assertions here that you need to firm up. The problem is none of these renewable technologies are as new as you try to suggest. I was looking at solar panel farm deals in the early 1900s. Ditto thin film solar panel tech, advanced battery technologies, and electric cars. Wind turbines are not new. Hydro is even older. So what is your basis for the claim that there are huge savings to be achieved with technologies that are in reality well established? Further, if you try arguing that the solution is new infrastructure…..building infrastructure has a massive energy cost. The energy cost of building a new home is roughly ten times that of the annual energy cost of running one. The Tverberg article has problems but at least she makes a go with data. I’ve actually looked at real deals, with forecasts, including their assumptions of increases in manufacturing production efficiency. Guess what? In every case, those assumptions were wildly optimistic. And here we are, nearly 30 years later….. Solar panels in the early 1900s! Yves, thank you for the thoughtful response. Still, I think you are underestimating the precipitous drop in the cost and performance in all the relevant scalable renewable energy (sRE) technologies like solar and wind. Solar PV alone has dropped its costs by more more than 97% in the last 25 years but critically more than 80% in the last 10 years (sample link). Comparing deals from 1990s (which I think you meant) and 2019 is like comparing a 1960s jet to a 787 fleet (perhaps not the best comparison but you get the idea). This is not to imply that a 100% renewable energy transition would be painless or would not have implications in the way we structure our society. Material and spatial constraints are definitely there and this is why we are not letting these models to grow forever. Capitalism at this stage needs to come to terms with its limits to growth. Still, as far as we can tell, there is sufficient material resources to get us there and a lot substitutes available. Our society has been stockpiling a lot of material that remains available for our future use (e.g. aluminum, copper, steel) (link) which will continue to be the case. Earlier forecasts that somehow lithium production will not meet demand (link) are met today with the reality that despite demand increase exceeding the expectations the price of lithium drops! This is not to say that everything is rosy and we will all get our panels, batteries and EVs with no effort. A very substantial reogranization and reset of global plans and economic goals is needed to make the transition a reality. The key contribution we are trying to make is that technically this is feasible and the data to support it is there. If after reading the papers you still have questions, I am happy to discuss more. It is the realm of policy and human social behavior that is the crucible of our change. Minor correction on the links, the Nature Energy papers linked are not Open Access at the link. There are some regions of the world where the sun is powerful enough to bring prices really down : Arabian peninsula, southwestern US, Northern Australia, Tibet…These regions are poised to provide energy for their close neighbours. This being said, the transportation of power beyond neighbour territories (I.e. most of the developed world population) is an unsolved problem. Using Synthetic hydrocarbon for that is prohibitively expensive, ditto for HVDC. Your paper only talks about electricity generation, but before saying that “technically it is feasible” one has to evaluate the costs of transmission, storage, and necessary conversion into other forms of Energy. I am not as pessimistic as Gail Tverberg (the EROI of nuclear and solar seem sufficient to me), but I believe her when she says there will be a long transition period during which final consumption will need to be curtailed severely to free the resources necessary for building all these new energy producing/transmitting/transforming infrastructure. Such reduced consumption will affect society’s capacity to service existing debts. I have some quibbles with this. I suggest that from 1900s to 2000s there were little incentives to improve renewables. – Improvements have been made in the manufacture of silicon PV panels and those are now much cheaper and more efficient (not much more but closer to theoretical limits of the technology) and with reduced losses by shadowing. That is why solar installations are exploding lately. Also, I believe that concentrating thermal solar panels have improved quite a lot. There is now a growing pipeline of not yet marketable –but probably soon– devices not based on silicon (organic, perovskite, hybrid…). As money is poured on those projects something will come to ligth. -Regarding batteries the old lead-acid batteries migth have their days counted as a growing number of installers are now prefering Li-ion batteries. Behind the Li-ion technology there is a growing set of alternatives being studied that face the problem of rare earths. These challenges have been treated loosely or theoretically in the past but are now being readily researched in many countries. That link to the Sower’s Way is much appreciated. Thank you. The paper is written to be accessible. I just need to note that the methodological meat is all in the supplementary material if anyone is interested to get into the details. 2)	one actual fact that isn’t even really explored but is apparent in the charts shown. Left to its own devices per capita energy consumption is a good indicator of overall economic activity. The conclusion should be that a holistic plan if going to be needed to replace fossil fuels. 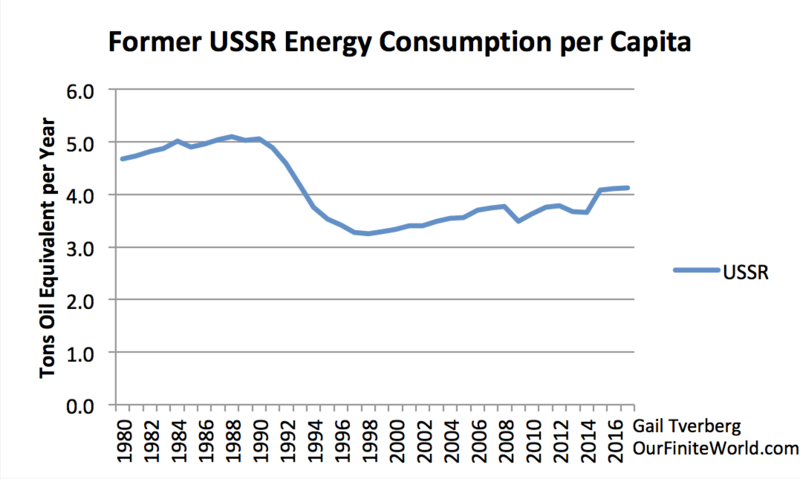 Energy consumption per capita will likely need to be curtailed in order to support a swift(er) conversion to other energy sources. Part of this holistic plan is a need to prevent energy conservation from being consumed elsewhere. For example, automobiles are radically more efficient now that 40 years ago, but at least for Americans that efficiency has been consumed by moving further away from work and buying bigger automobiles (and for those of you who will argue American cars are much smaller now than 40 years ago, you need to look at the whole fleet. American cars are smaller, but we buy far fewer of them today. We now buy far more trucks which have gotten way bigger and more foreign cars which too have gotten bigger). Even at 3am on a temperate night, NY state, by itself, needs 14,000+ MW to keep the hospitals, water pumps, 911, Amazon warehouses, UPS, bread ovens going. That’s a lot batteries (or flooded valleys for hydro storage) in a 100% renewable world. The scale of electricity (never mind transport fuel) to keep civilization going is staggering. Renewables aren’t a magic wand—barring global Manhattan Project/Apollo like R&D that started years ago. Just being realistic. One thing seems clear to me: The longer we delay the transition away from fossil fuels, the higher will be the cost, and the worse will be the result. I suppose 100% renewable energy by 2050 is based on the premise that aircraft will either be abandoned or drastically improved to fly on battery power… or have I overlooked another alternative? Biofuels have been tested successfully. Liquid hydrogen is considered feasible by some. Batteries may eventually improve enough for short hauls. Synthetic fuels is one way surplus energy can be stored. Good post and good comments. Lots to think about. I would humbly submit that the residents (and there are quite a few) of the Dancing Rabbit Ecovillage in Missouri have reduced their carbon footprint to about 10% of the average American household, while still maintaining a recognizably “middle class” standard of living. Passive design, renewable, distributed energy generation, agreements around sustainable practices, etc. can (and do) go a long way towards creating actual sustainability. So no, decreasing your energy usage does not equate to reducing your quality of life. As other commenters have pointed out, correlation is not causation. Great article, great discussion. Naked Capitalism is such a wonderful resource! I am reading Earth, Inc. by Buckminister Fuller. He re-vamped it with Critical Path. I recommend the latter if you read just one. Early 80’s time-frame, when global population was one-half the present. Much has changed. Much more has NOT. Not much discussion in here about grid intertie, globally, or tidal energy. Not top-down, but at the individual level. Buy a PV array, for your own roof. Do your laundry, dishes, etc during the peak sunshine of the day. Live with the sun. Walk and ride a bike, Stay home. If we wait for the government to make it happen, we are deluded. Individual actions in concert on a ‘right path’ will make a difference. And fer criminy’s sake, cooperation and sharing!!! Circling back to Fuller— Leonardo, Elon, Jeff Bezos, Jamie Doiamon and LLoyd Blankfein could never in aeons come up with the marvelous spaceship we ALL miraculously get to ride on and inhabit— hurtling through our galaxy at a million plus miles a hour. Lets re-tool and say no to hypersonic missles and ‘limited, targeted’ Nukes, and re-tool for Us All. That is a worthy make-work Green New Deal we should get after, globally. No they haven’t reduced to 10%, they are just not counting properly. Do the Rabbits use metals, glass, cement, … nails, tools … drink coffee, eat bananas …? I can believe Dancing Rabbits might delay things but their lifestyle doesn’t represent a sustainable future. Their ‘adjustments’ are neither wrenching nor without disruption to their previous way of life, nor without substantial costs for rebuilding their housing, investing in their own ‘grid’, and living remotely in a special community. How would Dancing Rabbit scale as a model for the rest of the public? I looked up the Dancing Rabbit website, and I think is is a great idea–a little reminiscent of the “hippies” in the sixties but with an ecological slant. I agree she fudged causality but a lot of what she says is right on. I don’t know why she avoids saying the obvious thing – that the entire structure of civilization needs to change in order to manage disruptions from fossil fuels “leaving us” because the producers can’t make a profit. Well, the first such change is obvious to me, we need to nationalize the production and distribution of fossil fuels while we do our best to transition to renewables. That transition needs to do things logically – i.e. don’t create a yellow vest revolution. France should have subsidized electric cars and busses long before it slapped a punitive tax on combustion engines. And it should have guaranteed jobs and incomes sufficient to keep the country employed and fed. So when Tverberg argues both sides of a situation she confuses me. Is it depletion and profiteering or is it loss of demand? Because if it is loss of demand then she is begging the whole question. And we are caught between oil company profits and a cleaner, more temperate world. 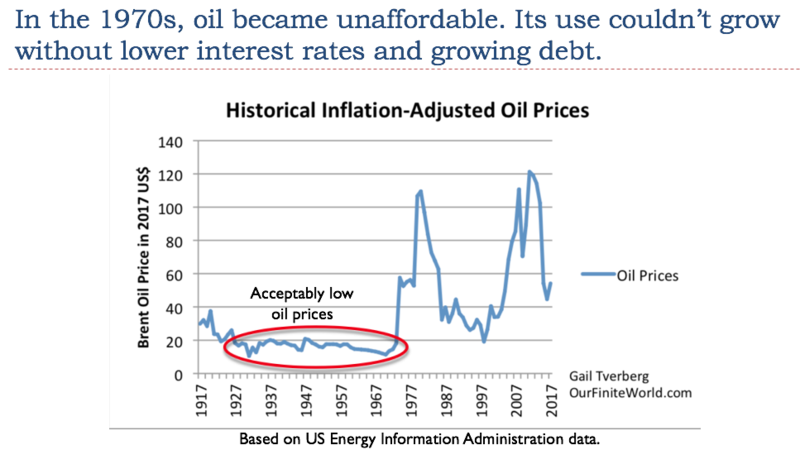 One point that jumps out is when she says “oil became unaffordable in the 70s” and she blamed high interest rates, which was true enough – it became both to expensive to use and too expensive to drill. But that was primarily due to the fact that our cold war economy had messed up the basics royally, captured the entire world in an economic dysfunctionality, a veritable ponzi world, and did all the wrong things. If our economy is dependent on fossil fuels at every level, we need to begin at the bottom, not the top. Manipulating interest rates is a bad joke. I do like the way she admits that conservation is essential. And conservation is an excellent road map. A living organism does the same thing when it is threatened; it shuts down its energy use at the periphery first. If we concentrated on replacing fossil fuels at the edges of civilization and built up best practices from the bottom to the top we could do it without any social disruption. I agree with your assertion the fossil fuel industry should be nationalized and the transition away from fossil fuels must be carefully planned. The transition is a problem much too complex for a Market ‘solution’. As you assert “the entire structure of civilization needs to change” including the structure of our economic system and government. However, my understanding of Tverberg’s argument differs. I believe she is arguing the depletion and profiteering diminishes the capacity of consumers to purchase fossil fuels — and all the goods that use fossil fuels in their production, decreasing aggregate demand for fossil fuels. Focusing on petroleum. the total return from producing petroleum depends on the price and volume of oil sold and the net return depends on the costs for getting the petroleum to market. The costs for producing petroleum increase as the amount of fossil fuels decreases, as do the costs for drilling and purchasing equipment — which includes interest. 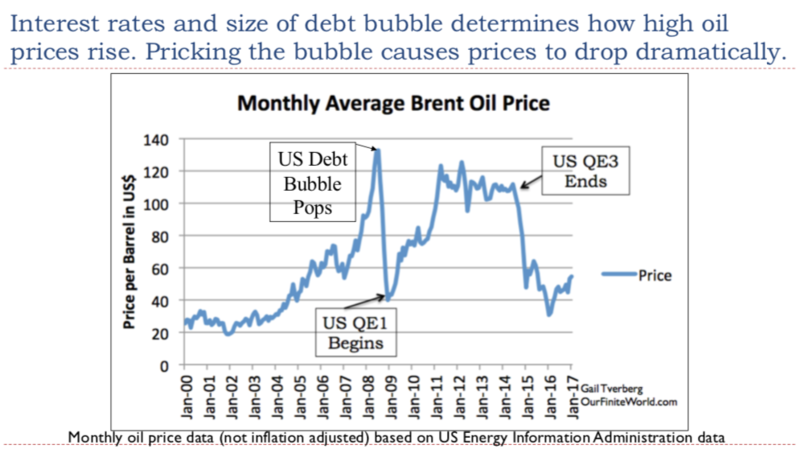 The Market for petroleum will collapse when the buyers run out of money and credit. 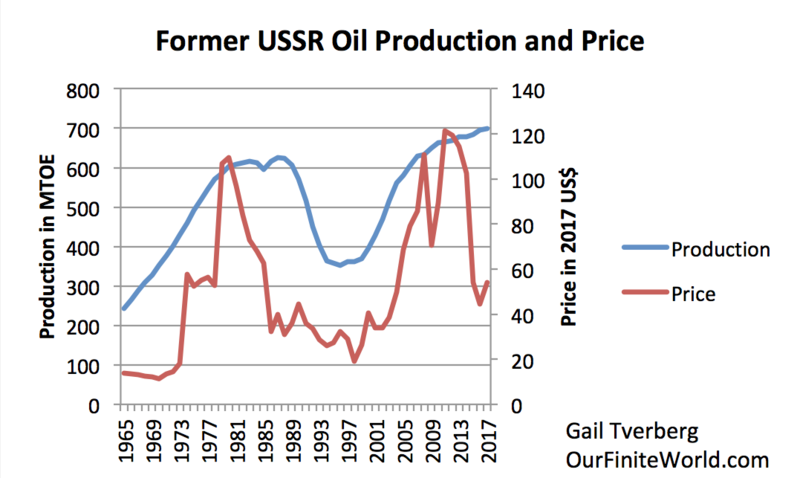 Production will collapse when sellers cannot sell enough petroleum — at the price buyers can pay — to earn sufficient profits to cover their costs for producing the petroleum. The Market will collapse either or both ways. I also disagree with your concluding assertion: “If we concentrated on replacing fossil fuels at the edges of civilization and built up best practices from the bottom to the top we could do it without any social disruption.” I believe no matter how we go about replacing fossil fuels it will require major changes in how we live — major changes in our economic system, in our government, … in our civilization. I think that might entail some social disruption. We can make the changes less painful through planning and without planning the best we can hope for is catastrophic collapse. When I say the “edges” I’m thinking of how we decline down the energy that starts at some level, say agricultural production, and works its way through society, feeding everyone and their pet. It now starts with fossil fuels. To disrupt the energy at the lowest level is guaranteed to disrupt anything above it, so just like the yellow vests in France, we are vulnerable unless we have safety nets. It is creating those alternative sources of energy, those safety nets, that concerns me. That’s where we should focus. Finance is totally off my radar. I’m not even thinking about how to finance this change-over. Just how to make it function smoothly. With finance sidelined, and compensated for by subsidy of some sort, I assume we can change the system. In the end that subsidy will save us time and money. Decentralizing the grid is one possibility. Localize energy production. We’re so conditioned to think about consolidation we discount local solutions. Is Gail’s piece on the 9th in response to the one on the 8th by Blair Fix et al? I only say this because Gail’s appears to be composed in a hurry and is getting causality wrong in places by ignoring US foreign policy. I agree with this post’s conclusion: “We can’t know exactly what is ahead, but it is clear that moving away from fossil fuels will be far more destructive of our current economy than nearly everyone expects,” but I’m not so sure about all the assertions along the way. I would argue for this conclusion differently, making use of some of the post’s warrants, or slight twists on them. I think it’s reasonable to assert that fossil fuel energy consumption, for now, includes a lot of discretionary use which would decrease as the price of fossil fuel energy increases relative to consumer income. At some limit the cost to produce will exceed the amount consumers can afford to pay and the returns to fossil fuel production will drop below the costs of production. The observation that each person added to an economy requires added energy “necessary because each person needs food, transportation, housing, and clothing, all of which are dependent upon energy consumption,” seems sufficient to argue that changes in the population or their per capita energy usage can be related to the size of the total economy. I’m not sure what to conclude from the charts in this post. Arguments for replacing fossil fuels with solar panels, wind turbines, et al. frequently discuss energy as though it were just a lump of ‘something’ — a lump-of-energy — and one lump can be directly substituted for another. I suppose the malleability of electricity, assuming present technologies, may trick thinking into the lump-of-energy fallacy but the malleability of electricity is not free. Energy comes in many forms — heat, light, electricity to name just a few forms — and each form of energy may be available in different amounts and intensity, or pulsed or variably available. It costs energy to convert energy from one form to another — even electricity — and most applications of energy require energy of a certain intensity relative to the surroundings. Many discussions of power hinge upon the lump-of-energy fallacy, treating energy as though it were some simple commodity which might be stacked in a corner and saved for later uses disregarding the particular characteristics of different forms of energy, the varying energy requirements of different applications, and of course the different capabilities and means for storing energy. Some forms of stored energy — fossil fuels — have special properties with special applications based on those properties. Where energy is located and problems getting it to where it is needed are too often ignored or brushed aside. Arguments for solar or other energy sources based on the price per kW paid to energy producers at the Grid, as provided for in Federal Law, implicitly assume the lump-of-energy fallacy. I am skeptical and concerned regarding the sustainability solar and wind power as replacements for fossil fuels. An installation of solar panels is supposed to last around twenty-years, and there are some indications the energy they produce may slowly diminish over that twenty-years. How will the replacement panels and associated electrical components be manufactured? LEDs are great, but how will their replacements be made when they burn out? Where will these things be made? Manufacturing materials we take for granted, like steel, concrete, or glass require large amounts of intense heat. Where will that heat come from? How will we make tires and roads? The way global manufacturing industries are structured today, no one location produces all the inputs for manufacturing most items. In the case of the U.S., relatively few manufacturing industries remain located in-country. If only solar power and wind power and other ‘replacements’ for fossil fuel power generation fed the Grid — assuming away the problems of balancing the intermittent availability of some of the sources — the electric Grid In the U.S. is old, extremely complex, and badly maintained. Energy sources could be located adjacent to where the energy is used and they were before the introduction of alternating current. I believe the Green New deal has given little consideration to repair and improve maintenance of the Grid, or question whether feeding alternating current into the Grid obtained by converting electricity from direct current sources near many direct current devices using that power is always the best solution. As I was reading, a particular paragraph smacked me in the face. I will copy-paste that paragraph here outside it’s context. This is a major insight which Nobel Prize-winning nuclear chemist Frederick Soddy had decades ago. It is what led him to write his book: Wealth, Virtual Wealth and Debt: the Solution of the Economic Paradox. ” Money drives the train.” Really? No. Fuel drives the train. Charles Walters and others carried this further to remind us all that humanly-useable raw materials, as prepared for use through the guided application of energy; are also originational to a functioning bio-physiconomy; right up there with the energy-itself to prepare them with. One hopes these and other books like them are read and kept in mind as one reads articles like this . . . which can serve as a jumping-off point to books such as the ones I just mentioned. ( One notes that Tony Wikrent’s economic analysis articles are now being featured every Friday at Ian Welsh. One hopes Tony Wikrent says more here from time to time. One wonders whether Tony Wikrent has heard of Charles Walters, Acres USA, etc. One hopes that he has). With the right leadership the move to solar and wind can be made far quicker than most people realise. All that is required is the infrastructure that allows solar users to sell their surplus energy into the grid – a few incentives would do wonders. Look at Germany, a country where the sun hardly shines. And Portugal and others. There are also plenty of ways to store energy by pumping water up into natural reservoirs for later use – these have already been identified and wouldn’t require movements of people or destruction of habitat. Of course to do this on a global scale would require governments to govern wisely and not to bow to the pressure of fossil fuel suppliers and to relinquish their control over power production and distribution. The cost of solar and wind energy is now the cheapest source of energy. Period. Even well-established producers are turning to solar to avoid being left with stranded assets. Please watch – The Third Industrial Revolution: A Radical New Sharing Economy on YouTube. We needn’t go the way Gail suggests out of necessity only out of poor leadership.